The uncertainty caused by Brexit is having a negative impact on the Scottish economy and housing market, according to business advisers PwC. Its latest report predicts the Scottish economy will grow by 1.2% this year, and by 1.1% in 2018. It also identified a year-on-year decline in house purchases. Although the growth predictions are below the UK as a whole, the authors said there was "little separating" most of the UK outside London. The report said the sluggish growth was because of "slower consumer spending growth and the drag on business investment from ongoing political and economic uncertainty relating to the outcome of the Brexit negotiations". PwC in Scotland's regional chairman Lindsay Gardiner said: "While some may see concern at the fact Scotland and Northern Ireland are at the bottom in terms of GDP improvement, there is actually very little separating most of the UK. "This year the best growth we expect any region - except for London - will see is 1.5% and it is 1.4% next year. "Where concerns should perhaps be focused is around wage growth as many are offsetting limited growth through increased borrowing - which may have a longer term impact via interest rate rises or employment downturn. "It's too early to speculate on how the Brexit talks are going to impact growth, however current exchange rates have some offsetting benefits for net exports." In contrast, house prices in Shetland have risen by an average of 59%, which is higher than some parts of London. 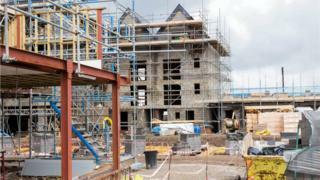 PwC has projected a slowdown in Scottish house price growth between now and 2020. By then, it believes the average property in Scotland will cost £160,000, up from £139,000 in 2016. "Housing transactions, which tend to be more volatile than prices, are where the uncertainty caused by Brexit has manifested itself most strongly," the report said. "Year-on-year the number of transactions have been down for twelve consecutive months." A Scottish government spokeswoman said: "The Scottish economy grew by 0.8% in the first quarter of this year - four times the UK-wide rate for the same quarter and the highest rate of quarterly growth in Scotland since the end of 2014. "Meanwhile, Scottish unemployment is at record low levels and we continue to be one of the top performing parts of the UK when it comes to inward investment. "But as this report makes clear, Brexit remains the biggest uncertainty - it continues to cast a shadow over the Scottish economy, and an extreme Brexit outside the single market poses a serious threat to jobs, investment and living standards." The spokesman added: "We will continue to do everything possible to support the performance of Scotland's economy, including through our £6.5bn infrastructure plan and new £500m Scottish Growth Scheme. "In addition, official figures show the housing market in Scotland is not experiencing the same level of slowdown as other parts of the UK - in the first five months of this year residential transactions in Scotland above £40,000 have risen by 2% on an annual basis."